Earlier this week, Entertainment Weekly released exclusive stills from The Force Awakens and a black X-Wing fighter could clearly be seen in the background. It’s no secret that J.J. Abrams and his crew have been mining existing artwork from the late Ralph McQuarrie for character designs and concepts, but the stealth X-Wing fighter owes quite a bit to Kenner’s abandoned Star Wars toy line for ’85-’86. By 1985, interest in Star Wars was waning. George Lucas was burnt out and a new crop of toys were saturating the market: G.I. Joe, Transformers, and some kids even accidentally got Go-Bots from their clueless grandmother. It’s hard to imagine now, but even with Saturday morning cartoons Droids and Ewoks, the continuing Marvel Comics series, and two made-for-television Ewok movies, nobody really cared about Star Wars anymore. The Star Wars faithful were a long way from Admiral Thrawn and Dash Rendar. However, that wasn’t going to stop Kenner from throwing one more Hail Mary pass to try and reboot the toy line that put their company on the map. 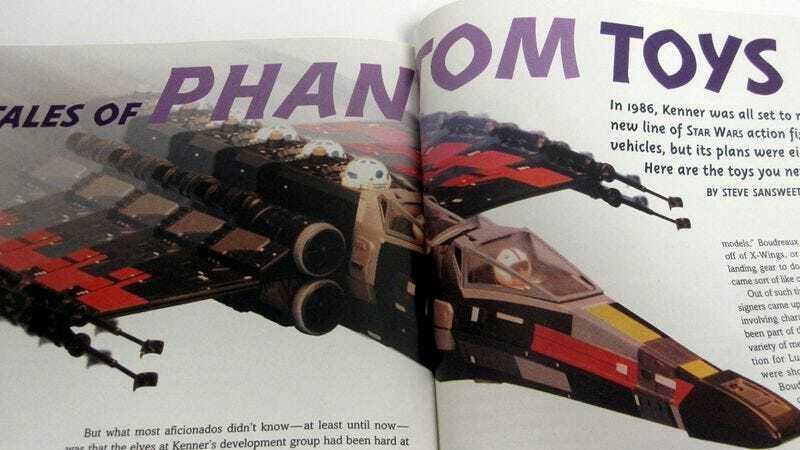 The public first got a look at the abandoned toy line in an issue of Star Wars Galaxy magazine from the mid-’90s that’s featured on Doomkick.com. The article was written by a Star Wars collector who became the head of fan relations at Lucasfilm. It was based on a presentation binder that was “acquired from a Hasbro employee who worked on Kenner’s Star Wars line during the ’80s” according to The Star Wars Collectors Archive, who apparently also got hold of one of those presentation notebooks. The notebook contains plenty of concept drawings of characters, such as new villain Atha Prime, who—along with his clone army—would do battle with the older and hopefully wiser group of Rebels. The Prime design is based on original concept art for the Emperor’s Royal Guards, and clicking through the site, readers will notice there is quite a bit of recycling going on. The stealth tandem X-Wing is two X-Wing toys molded together and painted black, while the Mongo Beefhead Tribesman—a Tatooine denizen—is a kit-bashed toy comprised of arms from Hammerhead, the body and head of Squidhead, and a chest harness from 4-Lom. The new Imperial Attack Droids seem to be made up of whatever droid parts were lying around the Kenner offices hours before the presentation was due. Kenner always got their money’s worth by recycling molds for toys. The Ewok Family Hut was a resculpted Treetot and most of the toys in the Robin Hood: Prince Of Thieves line used molds from Star Wars. Some of the toys from the presentation did make it into production as part of the Power Of The Force, Droids, and Ewoks lines, including an A-Wing fighter and the Tatooine Skiff. It really is too bad that Grand Moff Tarkin’s (said to have narrowly escaped the destruction of the Death Star in the presentation) Imperial Outpost Playset never made it into production, because that could have given the U.S.S. Flagg a run for it’s money. Perhaps we’ll see the Sandspeeder on Jakku this December.